Based on the figure below, which line depicts a quadratic function? A parabola is one example of a quadratic function, regardless of whether it points upwards or downwards. 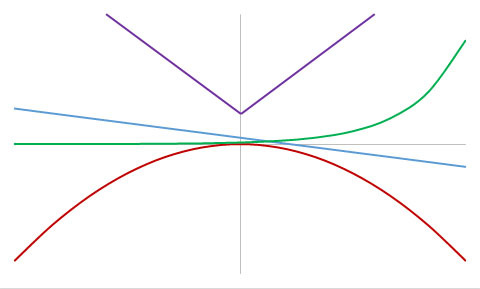 The red line represents a quadratic function and will have a formula similar to . The blue line represents a linear function and will have a formula similar to . The green line represents an exponential function and will have a formula similar to . The purple line represents an absolute value function and will have a formula similar to . Which of the following functions represents a parabola? A parabola is a curve that can be represented by a quadratic equation. The only quadratic here is represented by the function , while the others represent straight lines, circles, and other curves. New York University, Bachelor in Arts, English.